The human footprint has an ever-increasing impact on our natural environment, and if you look around, you do not get the impression that we as human’s care one bit about the environment we live in. There are still a couple of places in the world, which are not spoiled by human intervention, at least not yet. Those places are usually very remote and difficult to get to. A couple of years ago my friend and Canon Explorer of Light photographer, Onne Van der Wal, told me about his voyage on board a private sailing yacht “Shaman” to South Georgia Islands and Antarctica. I looked at his images of rough landscapes and wildlife, and got fascinated by the remoteness and sheer beauty of the place. I made it my goal to explore and photograph South Georgia and Antarctica myself one day, before it looses its uniqueness as a result of too much human intervention. 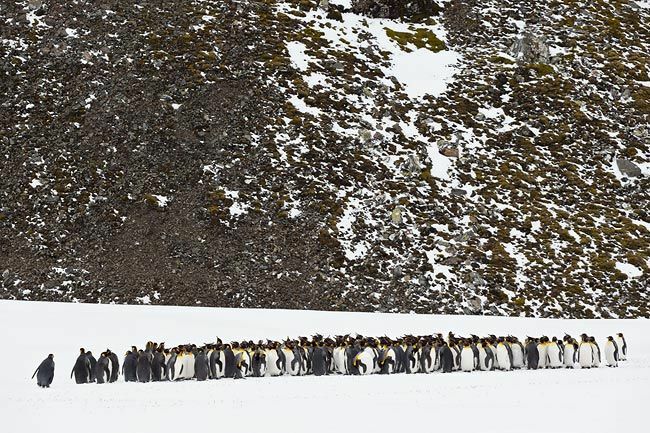 This past October I joined an expedition organized by Cheeseman’s Ecology Safaris to the Southern Ocean with an extended itinerary to the South Georgia Islands and the Falkland Islands. South Georgia was discovered in the seventeen century by Captain Cook who claimed the land for King George III, and became a whaling and sealing station until the early nineteen sixties, when active whaling was abandoned. 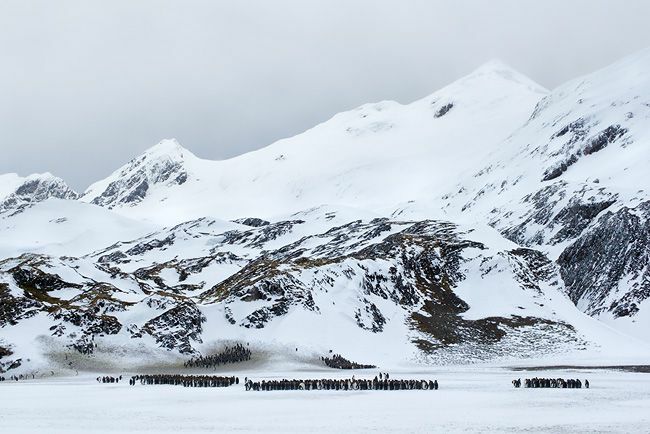 The island is uninhabited apart from a handful of British researchers of the British Antarctic Survey, who live year round at King Edward Point base at the old whaling station of Grytviken. 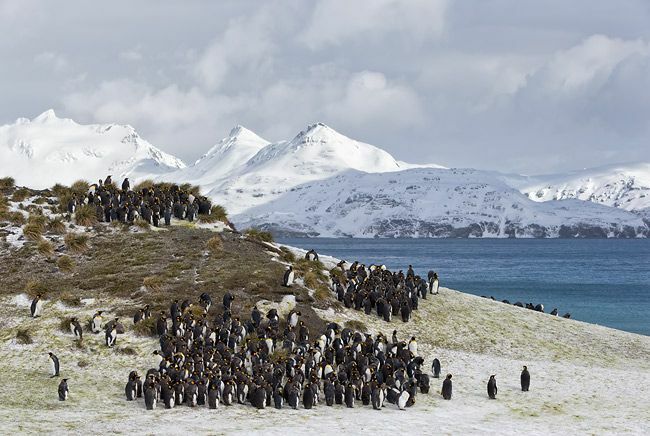 Large populations of wildlife live on the island and in the surrounding seas, and use the island as their main breeding area. 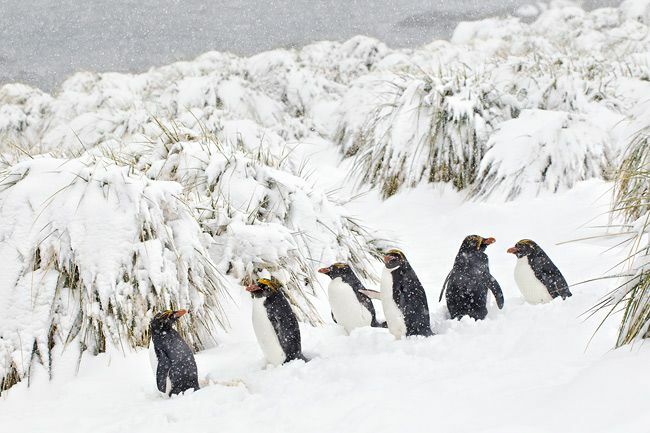 Various species of penguins, seabirds and seals call South Georgia their home in the vast remoteness of the Southern Ocean. Unfortunately, whales are not seen so often in the waters around South Georgia, due to the intensive whaling past. My journey started at Miami Airport with a flight to Santiago, Chile, were I spent three days as a guest of Osvaldo Larrain and Walter Baliero, two fine Chilean bird photographers. My good friend and teacher, Arthur Morris, creative photographer Denise Ippolito, and inspirational photographer and my roommate for the trip, Paul McKenzie, from Hong Kong, joined me. 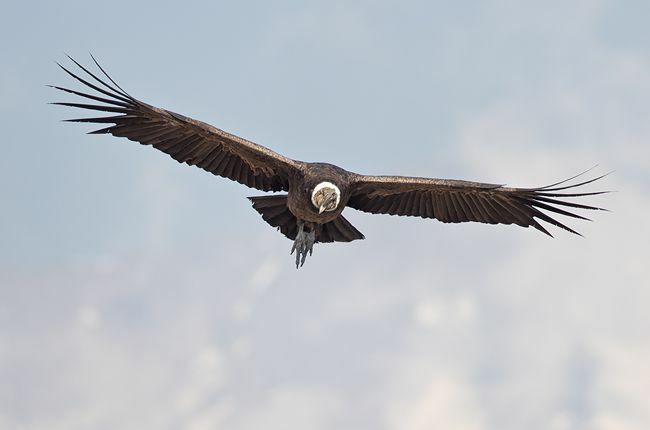 Our main target was to photograph Andean Condors high in the mountains close to Santiago and Inca terns on the coast. From Santiago our journey continued to Puerto Arenas in the south of Chile for a stopover before we continued to Mount Pleasant, the only airport in the Falklands Islands. We boarded our vessel the “Ushuaia” in Port Stanley and left the port after dark for a 3 day and 900 miles sea crossing to South Georgia Islands. During the sea crossing, which was rather smooth, we were followed by numerous seabirds that feasted on small shrimp-like crustaceans (krill), fish and squid that were washed to the surface by the propellers of the vessel. 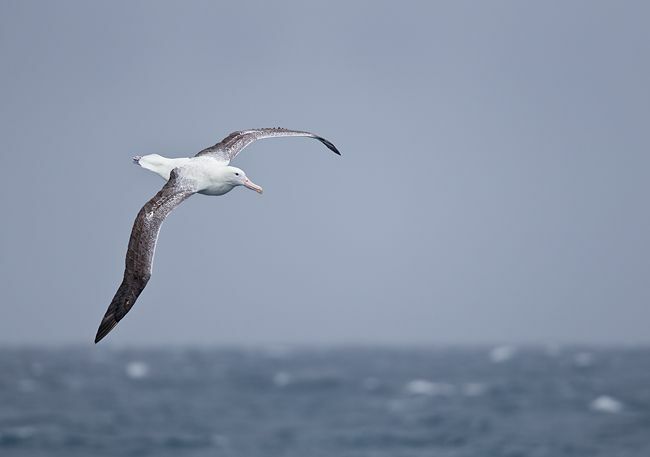 A constant fly-by of Black-browed Albatrosses, Giant Petrels, Cape Petrels and the occasional Snow Petrel provided great photographic opportunities, whereby the main challenge was to stabilize yourself against the rolling motions of the vessel. After about two days at sea we passed Shag Rocks, which are the lonely outliers of South Georgia at about 150 miles from the main island. On the afternoon of the third day at sea the north west side of South Georgia unfolded itself. It is hard to describe the island if you have never been there, but the following quote from Niall Rankin who brought an ex-Lifeboat to the island in 1946 to study birds, gives a pretty good idea: “If you were to take a giant carving knife, slice along beneath one of the highest mountain ridges of Switzerland, just where the huge glaciers tumble into the valley below, and then drop your slice of mountain, dripping with sugar-icing, into the sea, I think you would get a fair idea of the place”. South Georgia’s position is similar to the equivalent of northern England and Labrador in the northern hemisphere. 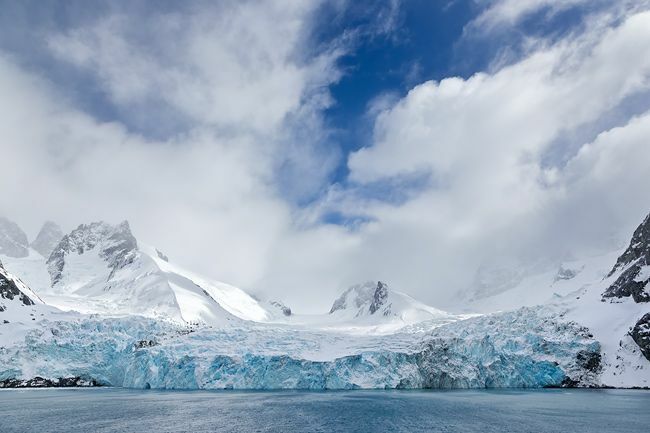 Its climate is almost Antarctic due to its position in the cold waters of the Southern Ocean. 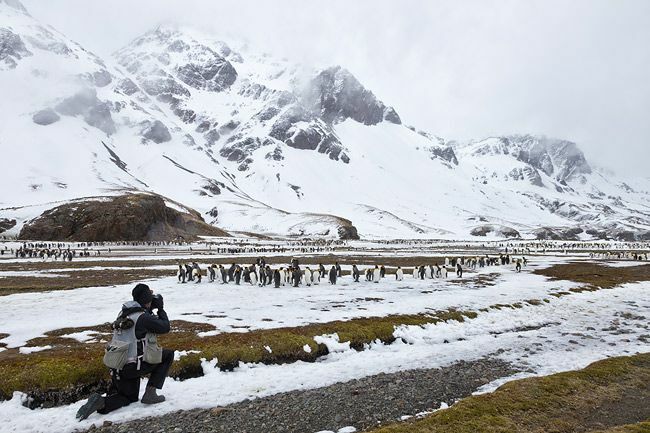 Its relative close proximity to the South American continent and a milder climate make it a favorite place for a great variety of animal and plant species. With the expectations high we made our first landing in a small bay called Elsehul. 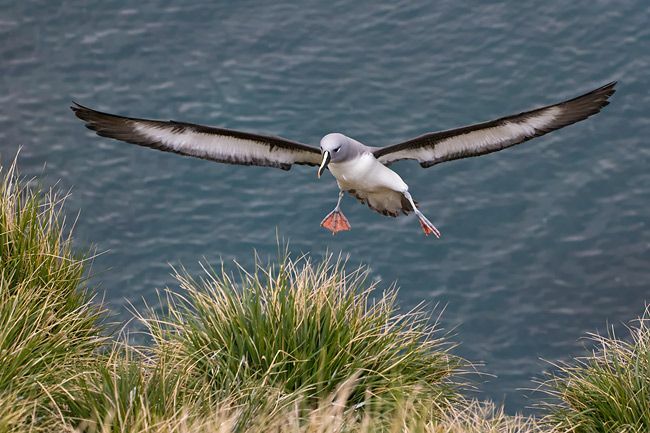 Photographing the Grey-headed Albatross, which is a rare and endangered species, was the main target of the landing. 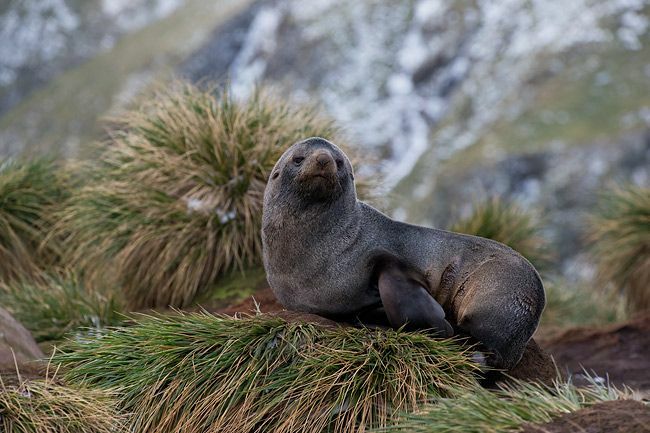 We quickly learned that to reach the nesting birds high on a cliff overlooking the bay, we had to conquer slippery muddy slopes and dangerous tussac grass terrain, with the occasional Fur Seal hidden among the grass. 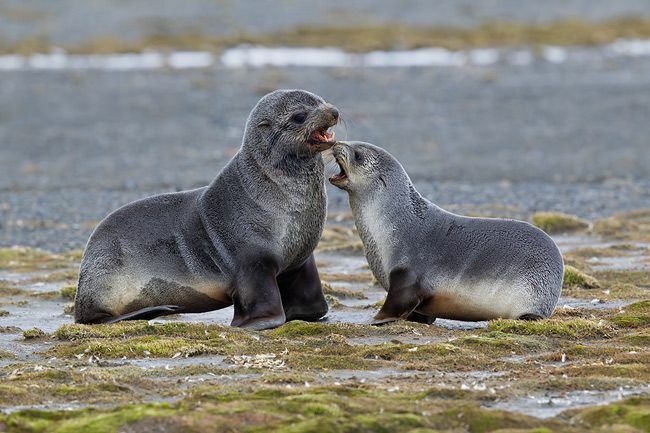 Fur Seals are usually very aggressive and territorial when they reach into breeding season, but since we were early in the season they did not provide too much trouble. 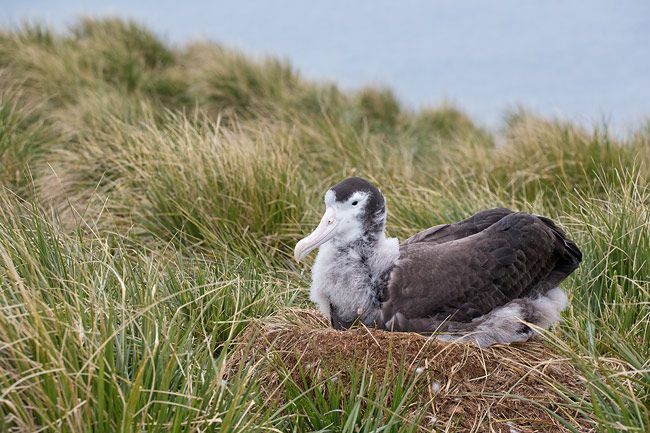 Once we reached the top of the cliff the Grey-headed Albatross nests were difficult to photograph as they were down the slope and partly obscured by high tussac grasses. I still managed to get some decent clear shots of this beautiful bird, including a nice landing image. 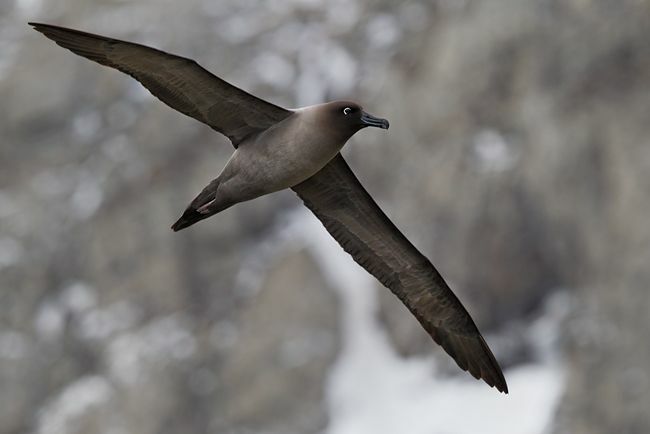 Another species of Albatross, the Light-mantled sooty Albatross, with its dark plumage and long slender wings was also circling around in the bay. The next morning we woke up early at another incredible location. During the night the vessel had moved to Right Whale Bay, which was named after the Right Whale, the first whale to be killed at South Georgia in 1894 by Norwegian whalers. 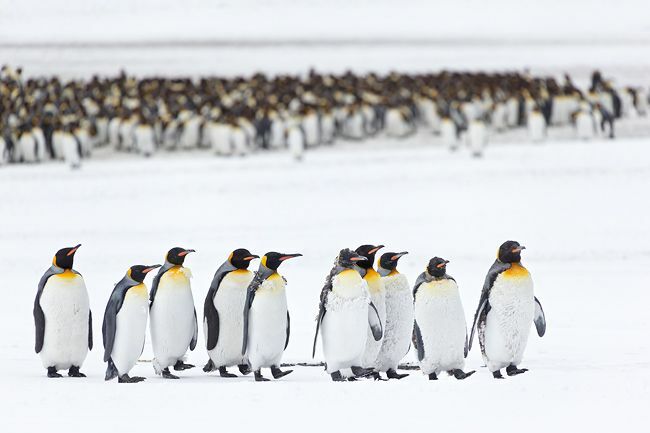 As we were early in the season (early Spring in the Southern hemisphere), the whole area was covered in snow, which provided an amazing backdrop for King Penguins. 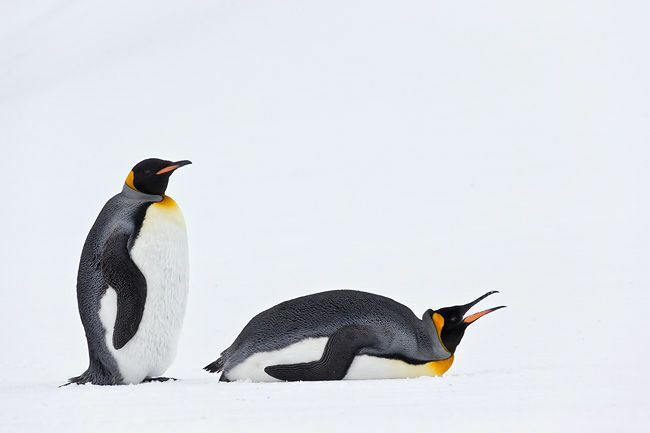 Immediately, it sparked the creative juices, and from the early morning onwards I was busy looking for graphic pattern of King Penguins in the snow. 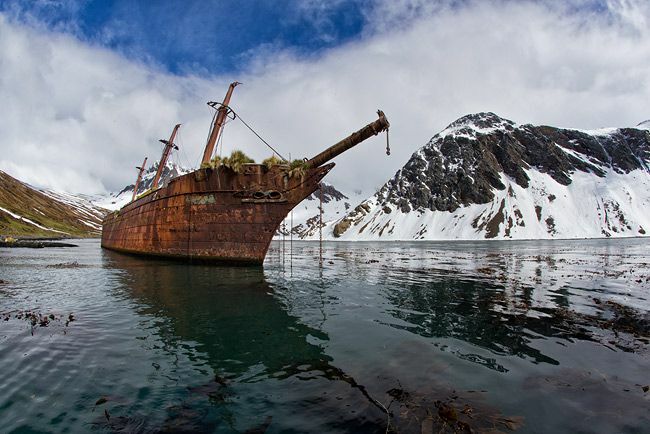 After lunch on the vessel the captain pulled up in the Bay of Isles, where we made a landing at Prion Island. 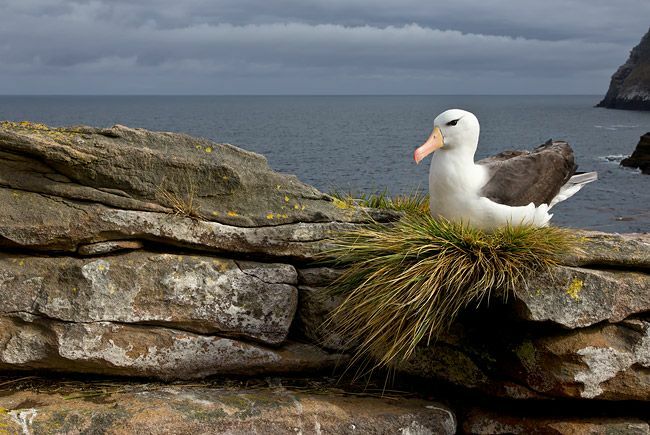 This small island is the main nesting site for the Wandering Albatross, which with its wingspan of around 10 feet has the largest wingspan of any bird. 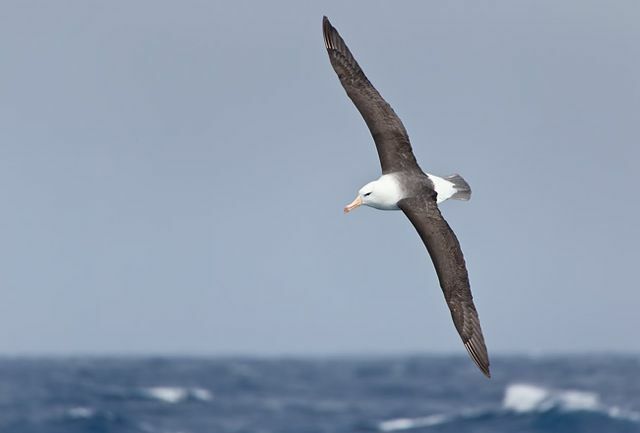 Wandering Albatrosses live very long, up to 60 years, but are very slow breeders. 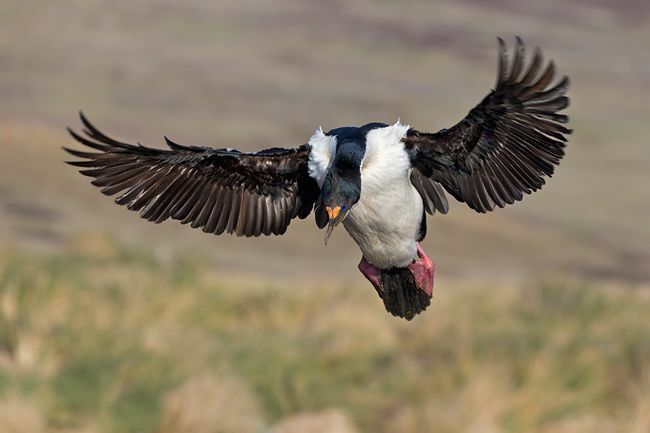 Only after eight years the females start laying eggs, and hatch one chick every two years. 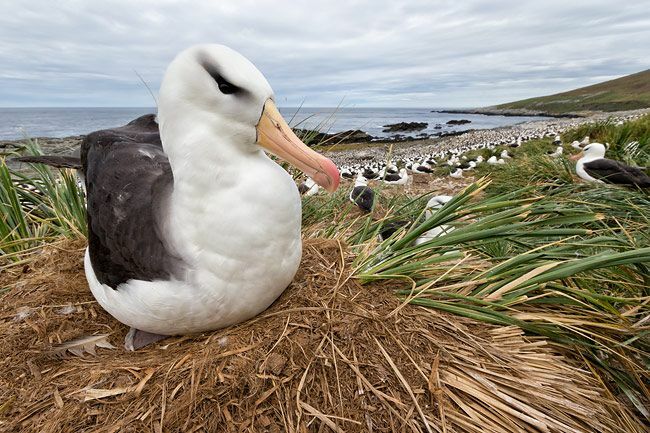 The population of Albatrosses is rapidly declining due to drowning as a result of worldwide fishing operations. 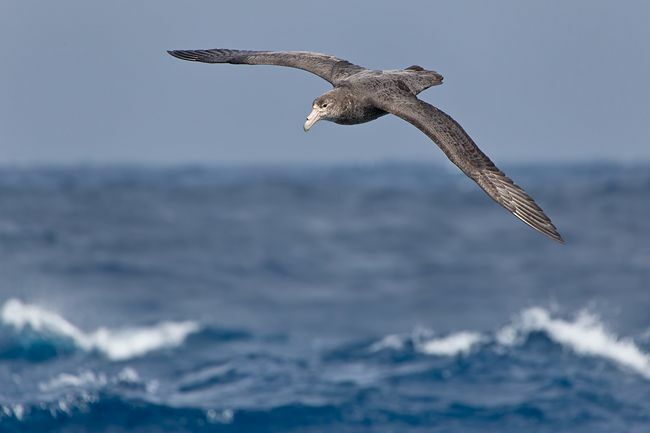 Another cause of death is the pollution of our oceans with plastics and debris, which is being mistaken by the Albatrosses as food. 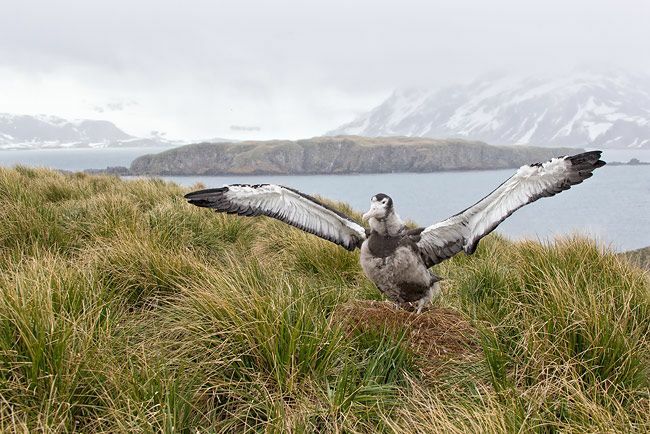 Once we made our way up the hill towards the nesting site, we only saw two Wandering Albatross chicks waiting for their parents to return with food from a fishing trip at sea, which could easily take up to 8 or 10 days. While the chicks were hiding in the grass when we got there, I was lucky that one came back to the nest and started flapping its wings. 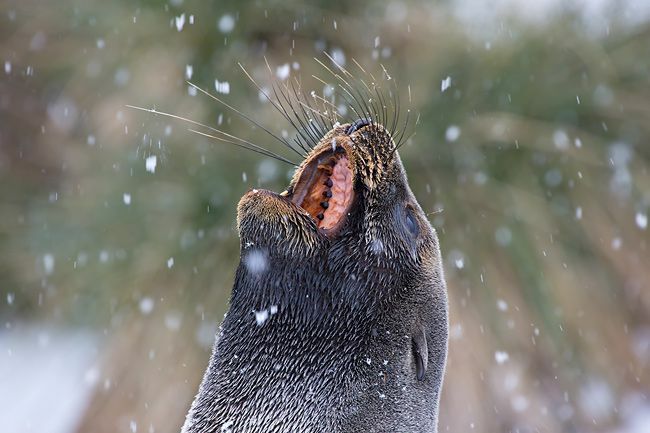 On the way down it started snowing lightly, which made one young Fur Seal look up to the sky trying to fetch the snow flakes while they were coming down. Our following stop the next morning was further down the north coast to a secluded inlet called Fortuna Bay. This snow covered valley provided access to one of South Georgia’s many glaciers. 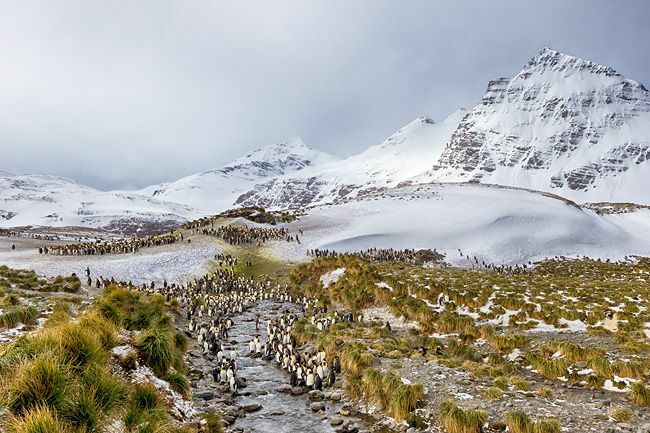 A large King Penguin colony was spread out over the entire valley floor, and gave us again the opportunity to create beautiful images of penguins in the snow, this time also with larges groups of brown colored downy chicks, called “oakum boys”. I was looking for different angles, patterns, shapes and details. 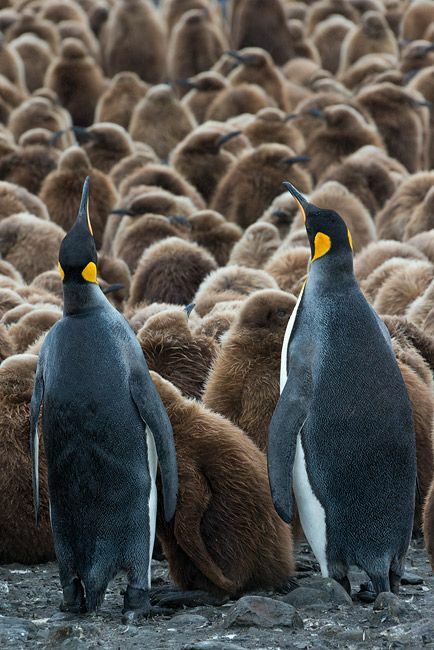 The King Penguins usually hang out in large groups around this time of year as they started the molting process to create a new set of feathers before they return back to sea to feed again. 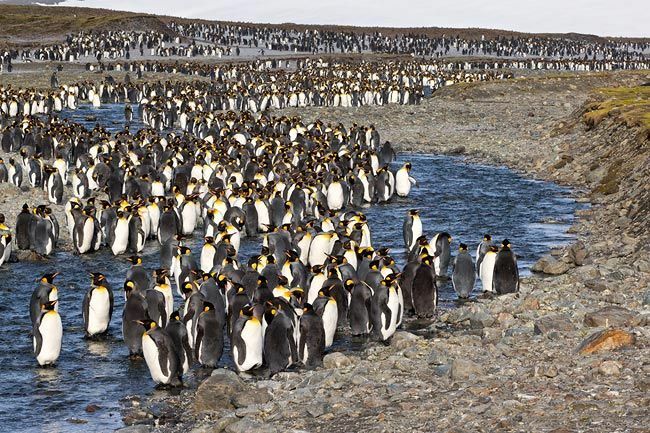 During the molting process, which takes usually about one month, the penguins can not swim or feed, and stand together in close knitted groups to stay warm and protected from the elements. 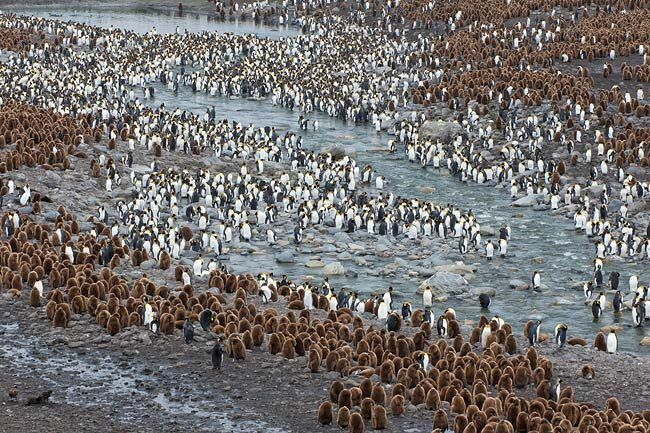 King Penguin colony spread out, Fortuna Bay, South Georgia Islands. Canon EOS 1Dx, Canon EF 24-105mm f4 @ 75mm, f16, 1/500s, ISO 800, Manual exposure. The next morning we entered the large bay of Ocean Harbour in early morning light. 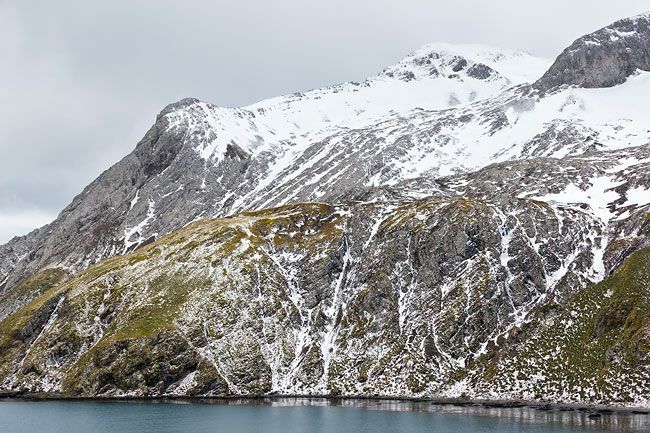 One of the old whaling stations mostly run by Norwegians was established in the bay. We spent the morning cruising through the bay in zodiacs, but the main attraction here was the old wreck of the Bayard, a three masted sailing ship used as a coaling ship for the whaling station. The Bayard lost her mooring at the coaling pier in Ocean Harbour during a severe gale on 6 June 1911 and ran aground on the rocks on the southern side of the bay, where she provides as a breeding site for South Georgia Imperial Shags. We moved further up into Cumberland Bay on our way to Grytviken, the only remaining whaling station at the island that is accessible to the public. A small museum, post office and old whalers church are the only restored remains of the large whaling station in the hay days of whaling at the island. 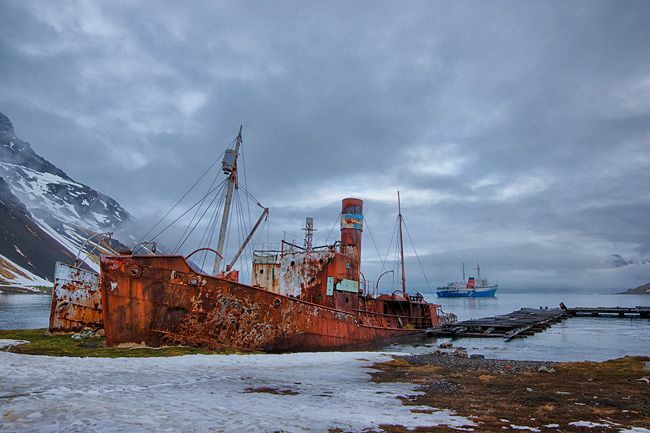 Old rusting artifacts, whaling vessels and equipment lay scattered around the village and provide for some interesting HDR photography. 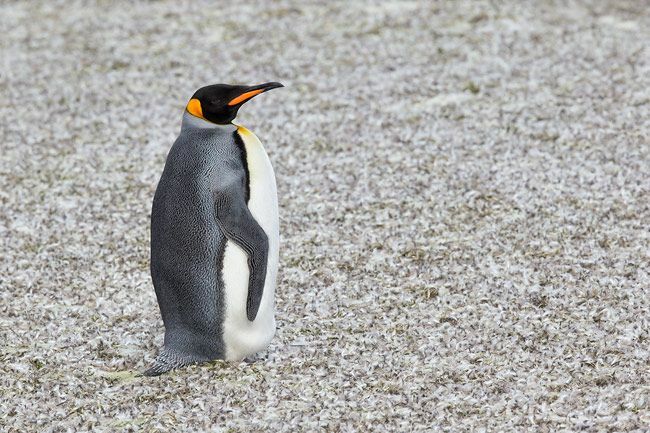 It is a short walk to King Edward Point where the Government Officer is located together with the research scientists of the British Antarctic Survey. 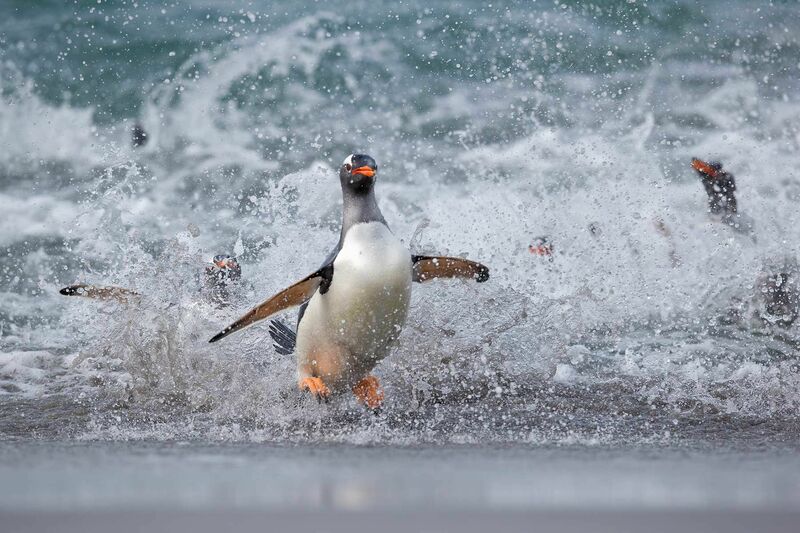 Overnight we moved further down the coast to one of the most famous and spectacular wildlife places on the island. We woke up to a beautiful sunny and calm day at Saint Andrews Bay. The bay is very exposed and often provides difficult conditions to land, especially if the winds suddenly increase to hurricane force within seconds and strong swells from the open ocean prohibit safe landings on the beach. This morning we were lucky with the weather and landed around 6am with sweet morning light. 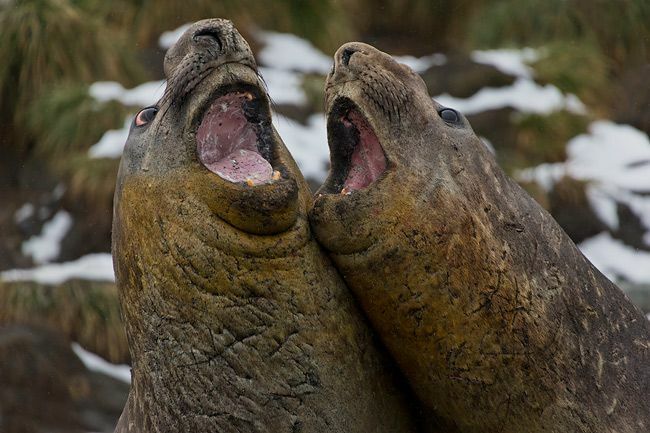 Saint Andrews Bay is home to over 200,000 breeding pairs of King Penguins and is also the largest breeding area for Elephant Seals on the island, which makes this a truly spectacular wildlife scenery surrounded by snow covered mountains and glaciers. The sheer number of wildlife provides for an immediate sensory overload, and makes you really wonder where to start, as everywhere you look there is something to see and to photograph. This day proved to be the hardest day from a photographic point of view, with the main goal to create some order in the amazing chaos surrounding me. 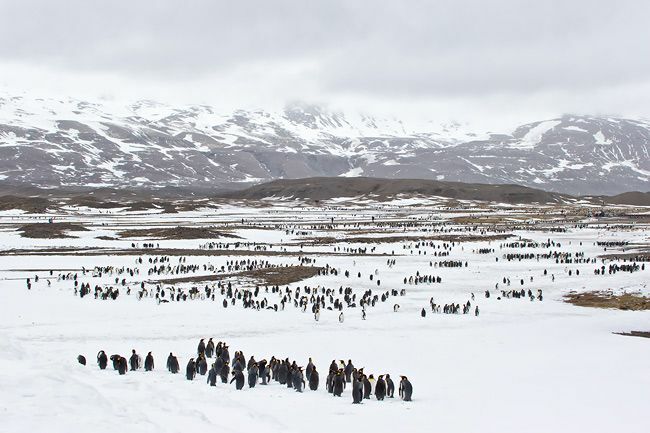 I walked the extensive area looking for clean edges and pleasing perspectives, and ended up on a ridge overlooking the King Penguin colony, where adults and young “oakum boys” provided nice visual patterns. During the early morning the clouds moved it and provide a nice soft box of light with the occasional wet snow. 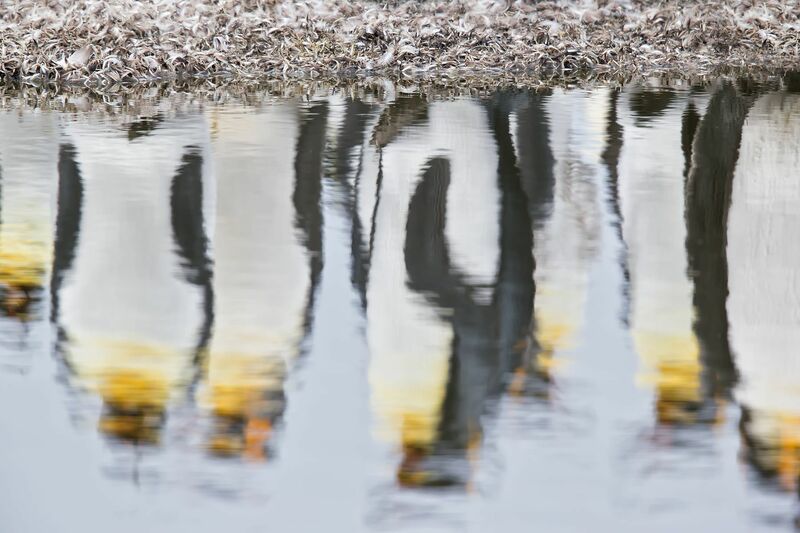 I came across a group of penguins standing in a bed of molted feathers and snow, and got excited about reflections in the water. 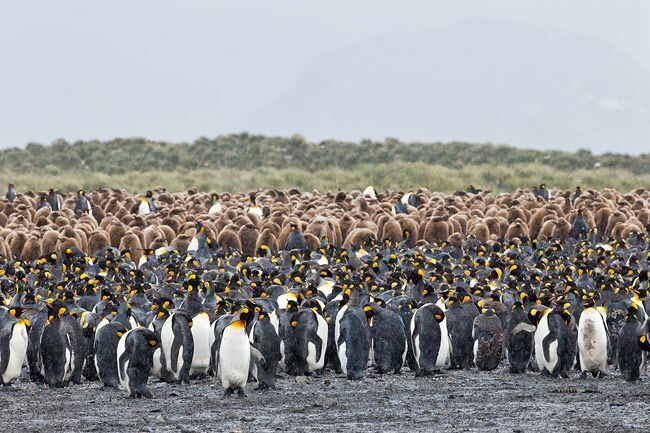 While making my way back down to the beach, it was funny to see how King Penguins coming back from a feeding trip in the ocean had to work their way through the densely packed Elephant Seals to reach the colony. Around 4pm the captain blew the horn on the Ushuaia to signal that we had to get back to the zodiacs as the ocean swell had increased substantially and boarding the ship was going to be a challenge. Impressed with this magnificent place and totally exhausted this great day came to an end. Next on our itinerary was a visit to one of the largest fjords on the island. We entered Drygalski Fjord in the morning with bright blue skies, and slowly made our way up to the Risting Glacier at the end of the fjord with towering walls of ancient rock on each side. South Georgia has a total of 160 glaciers filling valleys and forming icecaps, but all have retreated since in the last hundred years. After a quick zodiac ride into the neighboring Larsen Fjord, we left for a circumnavigation of South Georgia to explore the rough, dramatic and inhospitable south coast of the island. Risting Glacier at the end of Drygalski Fjord, Drygalski Fjord, South Georgia Islands. Canon EOS 1Dx, Canon EF 24-105mm f4 @ 24mm, f13, 1/1000s, ISO 400, Manual exposure. When we rounded the south eastern corner and passed by Cape Disappointment the weather had turned and while we navigated up the southwest coast the visibility was really bad and low clouds and mist covered the spectacular views and vistas of South Georgia’s rough mountainous terrain. Cape Disappointment stitched (5 frames) panorama, South Georgia Islands. Canon EOS 1Dx, Canon EF 24-105mm f4 @ 70mm, f8, 1/250s, ISO 400, Manual exposure. 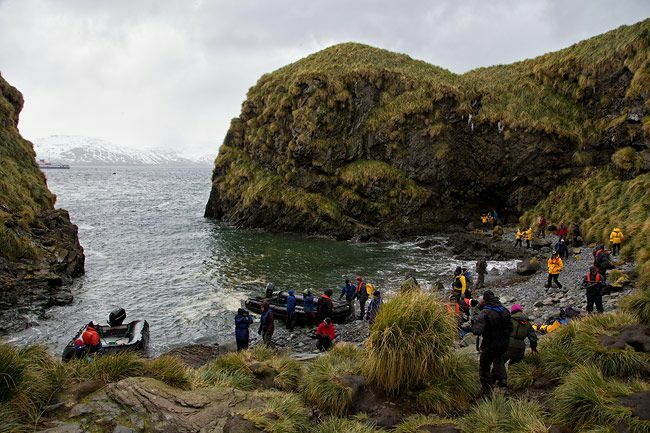 We made a quick stop at King Haakon Bay, were we visited the little cove (Cave Cove) near Cape Rosa were Sir Ernest Shackleton first landed with the 23 ft James Caird after an horrendous and brave voyage of 800 miles in 17 days on his escape from Elephant Island, Antarctica. If I think about the story of the unfortunate Imperial Trans-Antarctic Expedition and the adventures on board the Endurance it still gives me goose bumps. Shackelton's Cove near Cape Rosa, King Haakon Bay, South Georgia Islands. Canon EOS 1Dx, Canon EF 24-105mm f4 @ 24mm, f8, 1/640s, ISO 1000, Manual exposure. Before we rounded the north eastern corner of South Georgia again we made a quick stop at Undine Harbour. This bay was on the other side of Elsehul were we made our first landing. 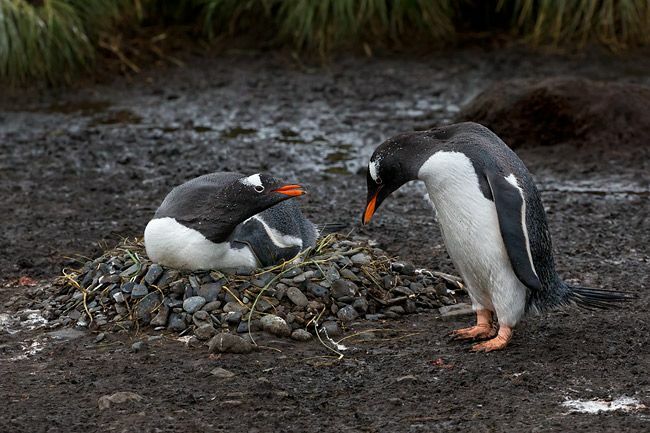 We revisited the Grey-headed Albatrosses again for some flight photography, and close to the beach watched Gentoo Penguins build their nests solely out of little rocks. After we finished the circumnavigation of the island we visited another amazing location in the Bay of Isles on the north side. We spent the morning at Ample Bay were the King Penguins were beautifully placed against the snow covered hills and mountains. I spend some time creating HDR landscape images to capture the full range of the scene, before venturing further into the hills. In the afternoon we relocated to the other prime attraction in the bay, Salisbury Plain. A wide flat valley surrounded by snow covered mountains and an abundance of wildlife. 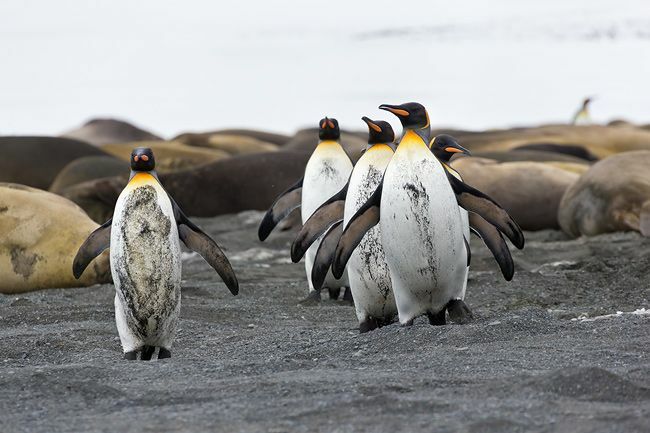 The beach was filled with Fur Seals and Elephant Seals, and the King Penguins were grouped together further inland towards the mountainside. 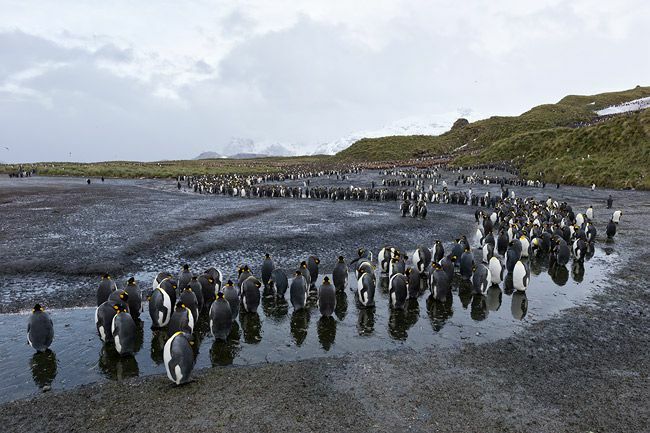 It was a wet, rainy and muddy location at the penguin colony. Many adults and “oakum boys” mixed together. After taking the usual images I was looking for a different perspective to show the vastness of the scene. The only choice was to climb a near vertical mountain wall overgrown with tussac grass. A pretty daunting task with all my equipment. After my good friend, Artie Morris, lost his new Canon 500mm lens and Canon 1Dx body earlier in the trip due to a simple misstep, I was really cautious, and decided to leave my 500mm and 1Dx at the bottom of the hill. 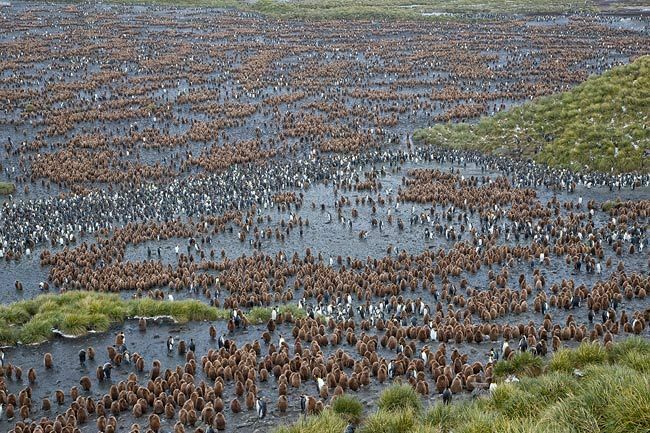 After a horrendous climb, while hanging on to the tussac grass, I was surprised by an amazing view of the colony. 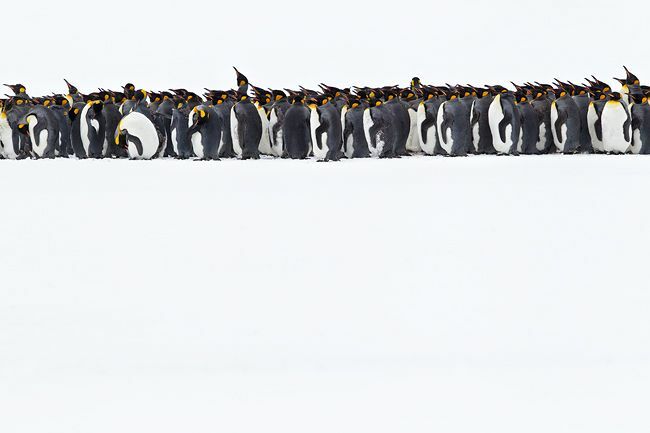 The patterns of adult penguins mixed together with juvenile penguins, was simply spectacular. 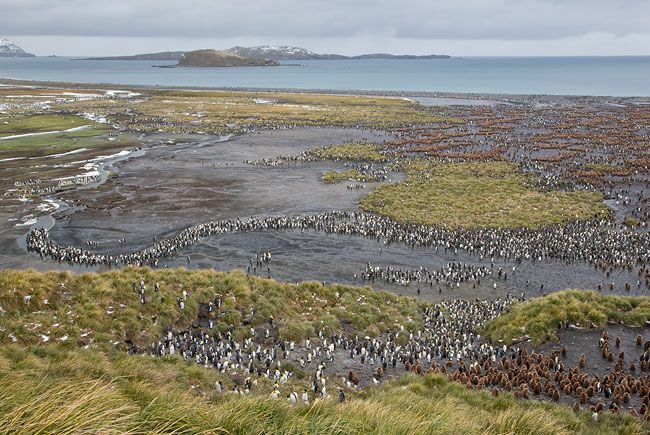 During the night we relocated again to the south east corner of the island to Cooper Bay which host a large group of Macaroni Penguins. 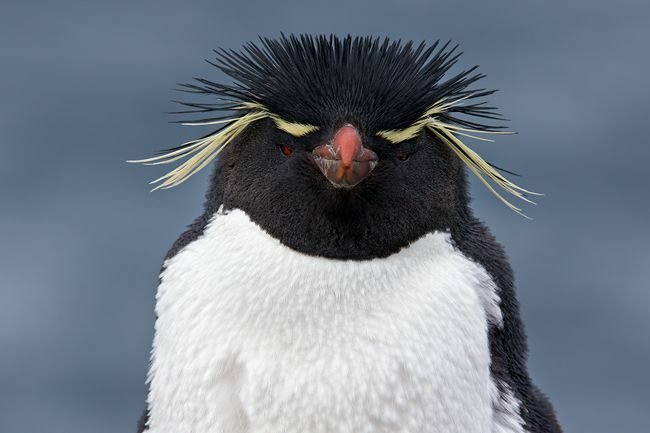 The Macaroni Penguins are a little smaller in size then the King and Gentoo Penguins but feature beautiful bright yellow feathers on their head, which make them very photogenic. 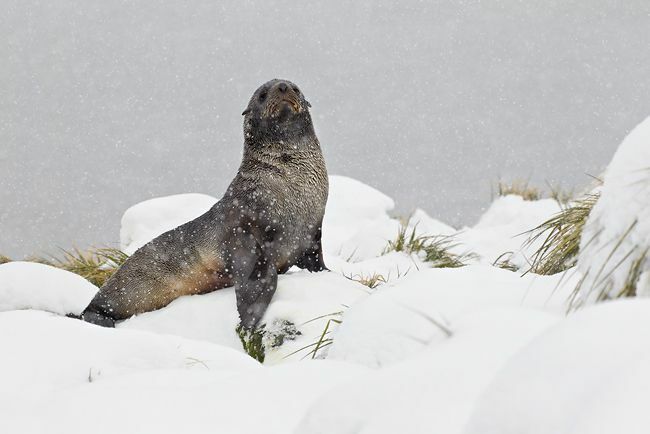 When we woke up we found the deck of the ship covered in 6 inch of snow, and it was still snowing heavily when we landed at a small beach site between the rocks, which was also occupied by quite a number of Fur Seals. The climb, which usually is quite eventful with lots of tussac grass and mud holes, was surprisingly easy as about two feet of snow made for a nice smooth track to the colony. 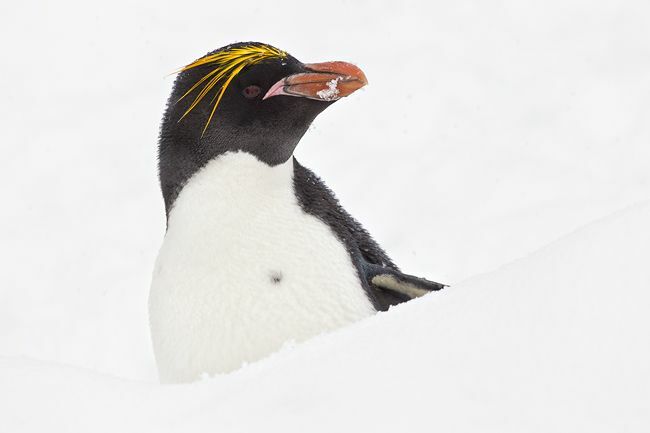 With thick snow flakes coming down the photography was challenging, but provided for some nice close up images of Macaroni Penguins. On the way back to the zodiacs we had some fun sliding down the hill through the snow, and landing just in front of the Fur Seals. 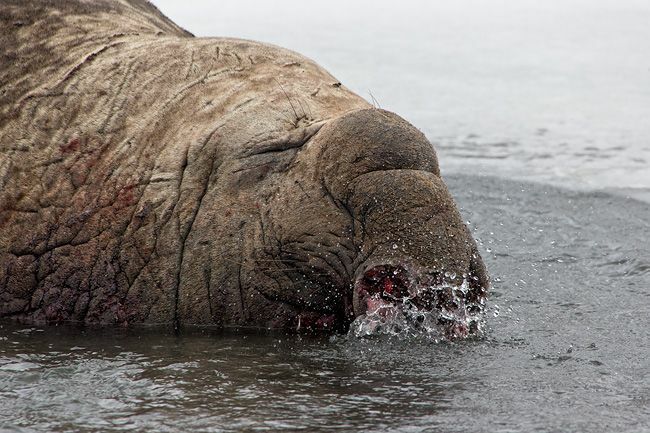 During lunch on board we moved to Gold Harbour were the beach was covered with Elephant Seals. This location is surrounded by mountains and glaciers, but all were covered in the mist, which provided for a ghostly grey atmosphere. 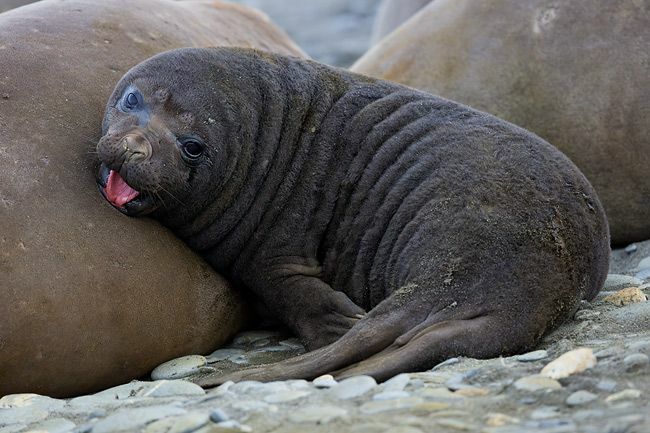 The Elephant Seals live in groups of cows lead by a bull called the “beachmaster”. The beachmaster defends his harem against other bulls. Since the size of the bulls is massive, they can weight up to 4 tonnes, a challenge between them can be pretty frightening with lots of roars and fierce fighting before one of them retreats (usually not the beachmaster). I once had to get my tripod out of the way to prevent it from being crushed by angry bull. We left Gold Harbour in the evening to make our next landing at Godthul the next morning. This would be our last day in South Georgia before heading to sea again on our way to the Falklands. The morning in Godthul, with the remnants of an old whaling station, turned out to be really wet, and while we set foot ashore it started to really come down. My roommate, Paul McKenzie and I decided it was not worth it to soak our camera equipment, and decided to go straight back to the ship and work on our images instead. The last landing at South Georgia was a second landing at Right Whale Bay, were we had great success more than a week ago with the white snow covering the ground and providing such a great backdrop. This time conditions had changed and the snow had melted quite a bit leaving large areas of ground visible through the otherwise wet snow. I decided to take a different path this time, and took a right turn up the hill to see what was behind it. 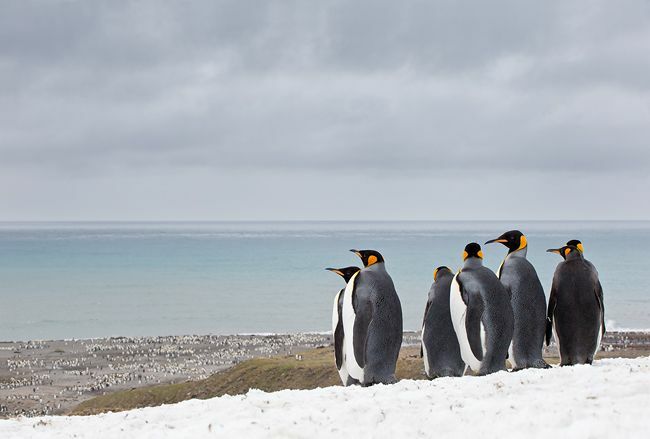 I encountered a large group of King Penguins returning over the hill on their way back to the colony and spent some time photographing them against a grey sky. Back on the ship we lifted anchor and set sail for three days at sea on our way to the Falkland Islands, the next stage of our expedition. Seabirds were trailing the ship and seemed never to get exhausted, due to their efficient flying techniques. 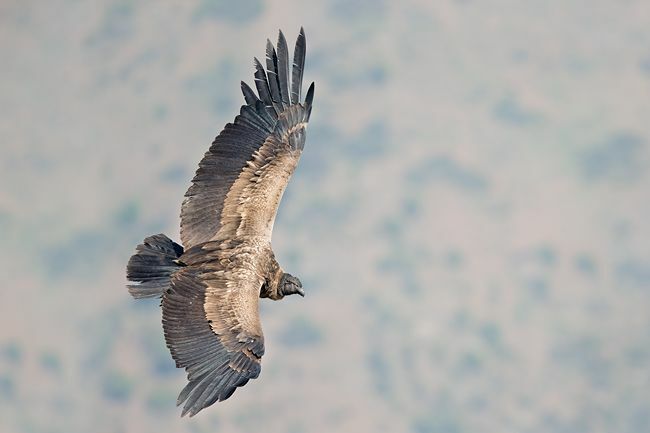 They glide over the water with hardly any wing beat, and manage to extract energy from the wind as they break the crest of a wave and bank sharply in order to turn into the lee of the next wave. 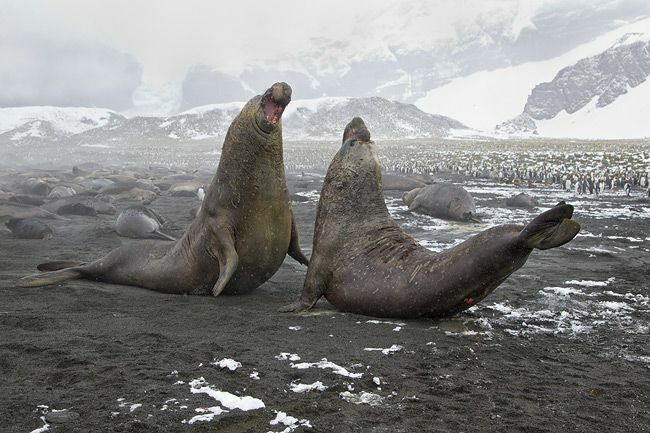 At the evening of the third day we arrived at Sea Lion Island were we anchored for the night. Early the next morning we landed on the beach after we made our way through the extensive kelp fields in the zodiacs. The main goal at Sea Lion Island was a Southern Rockhopper Penguin colony on the other side of the island where they breed on the cliff tops. In order to get there, we had to walk 3,5 miles through the hillsides and along the large tussac plantations along the coastline. The hike proved to be quite an effort with all the camera equipment and tripod hanging over the shoulder. 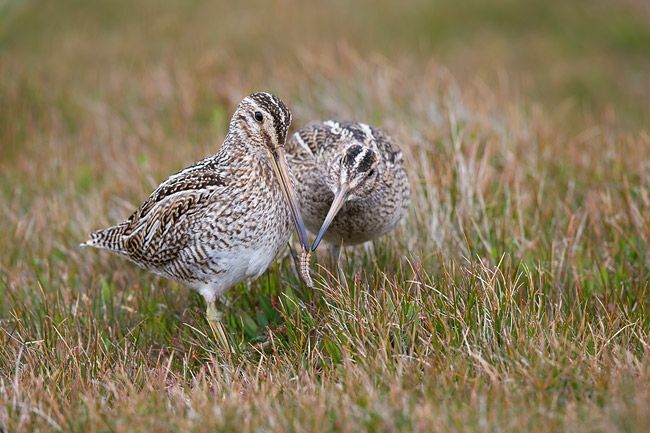 Halfway through the hike I crossed trails and stumbled on a pair of Magellanic Snipes that were busy feeding in the grass. It was a challenge to take nice images of the Rockhopper Penguins as it was difficult to isolate them against the rocks and their mates in the colony. Head portraits against the dark blue ocean seemed to work best for me. The walk back to the landing beach was the killer of the day. 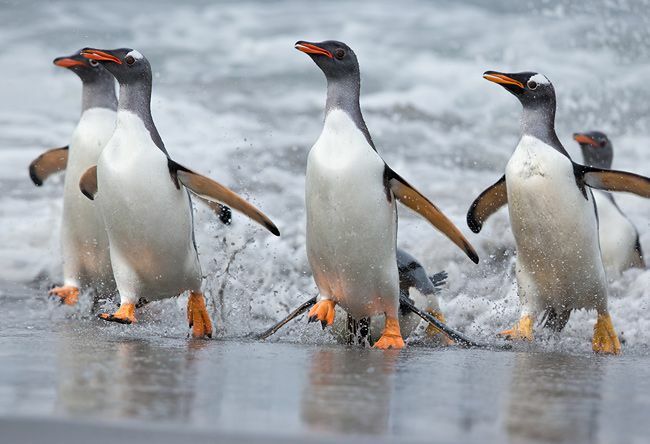 Totally exhausted I arrived at the beach, and had some fun with Gentoo Penguins shooting out of the surf and onto the beach. This is quite challenging photography as you are never sure where exactly they will come out of the water. 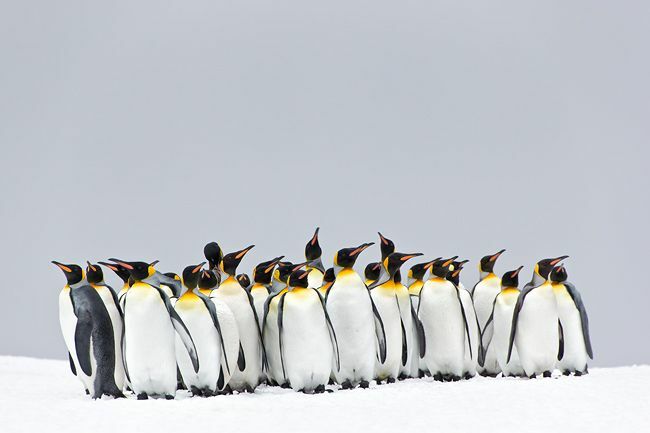 Getting the penguins sharp in focus proved to be difficult, but not impossible. For our second day in the Falkland Islands we visited Steeple Jason Island, which is one of the most remote islands on the north west side of the archipelago. Its characteristic twin pinnacle peaks make this island recognizable from afar. With its windswept hillsides it is a pretty harsh place often exposed to gale force winds and depressions. 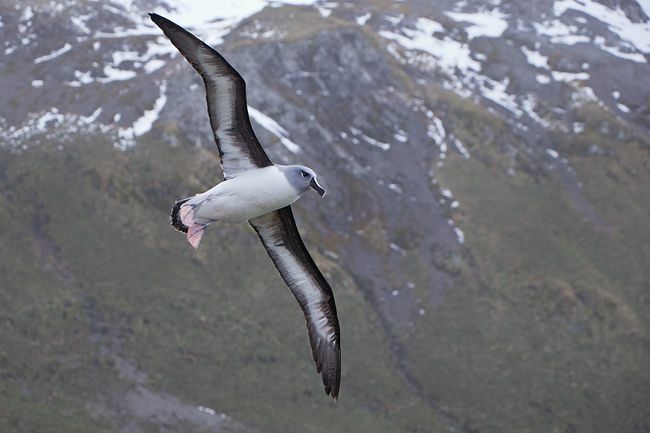 An ideal place for the Black-browed Albatross to call it home and use the island as their breeding grounds. After a hike of about one mile uphill I reached the albatross colony, which pretty much stretched out for about a mile along the coastline. Here the real trouble started, as the colony was shielded off by some dense and 6 feet high tussac grass vegetation. In order to work your way to the edge, you had to conquer a labyrinth of small hardly accessible paths between the tussac grasses. This proved to be a dusty experience as well when I finally looked at my camera equipment. 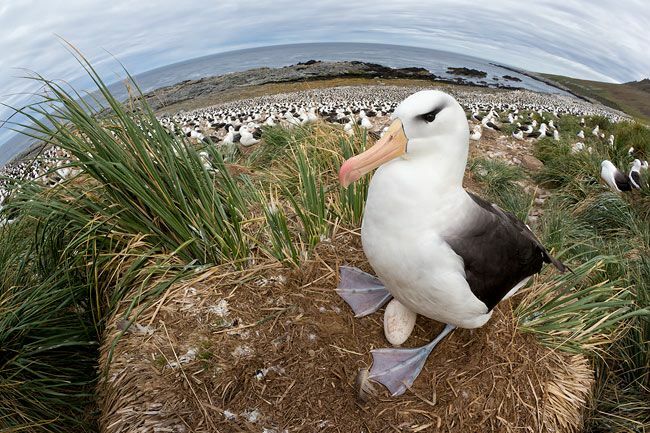 I had envisioned a wide angle image from an albatross on the nest with the whole colony visible in the background. It took me a while and a couple of relocations to find the right spot, but I finally succeeded in creating the image I had hope for. 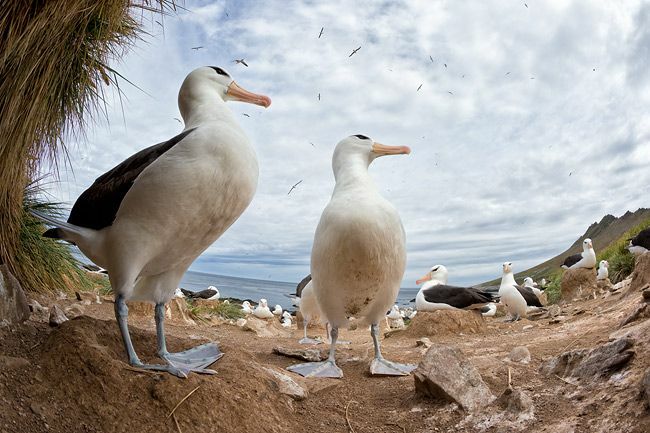 I also played around with the fisheye lens to create some not so usual perspectives of life in the Black-browed Albatross colony. 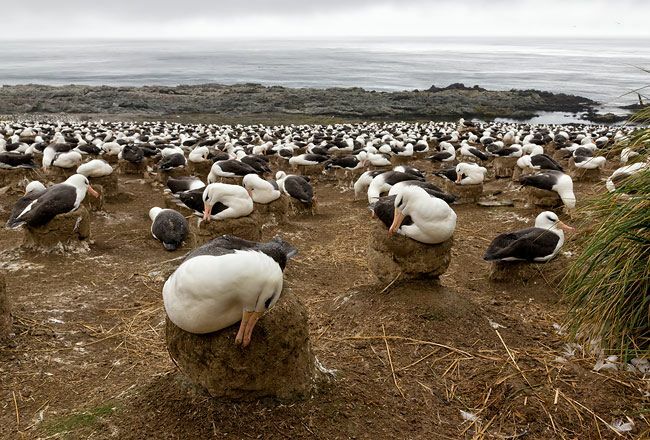 In the afternoon it started raining which was a signal to the nesting albatrosses to start building and reinforcing their nest. The nests are made out of mud. 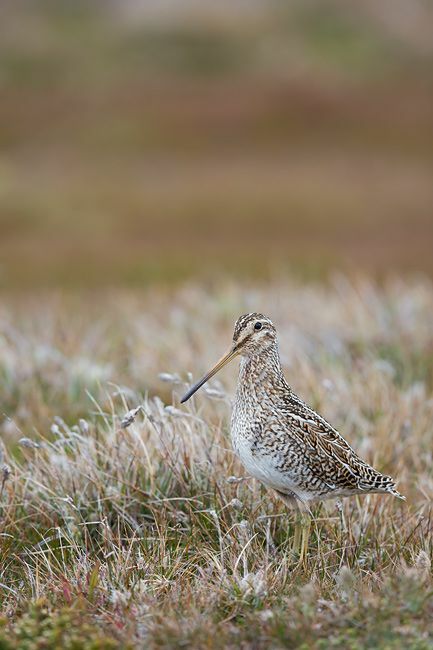 With their beaks they scrape the mud of the ground around the nest and apply it on to the sides. 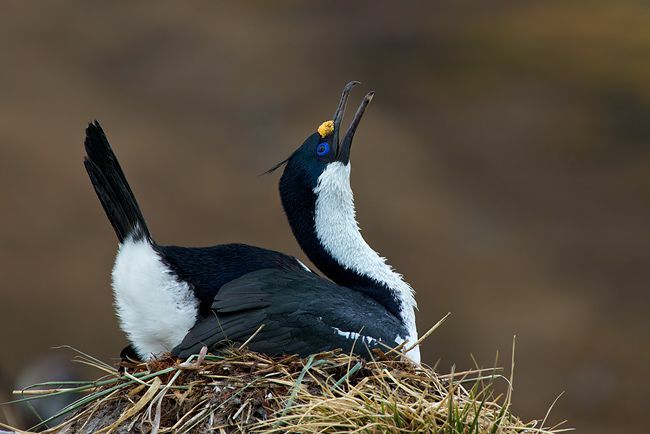 They have been doing this for years, so the nest are getting higher and higher. Our final day in the Falkland Islands brought us to New Island on the south west side of the archipelago. 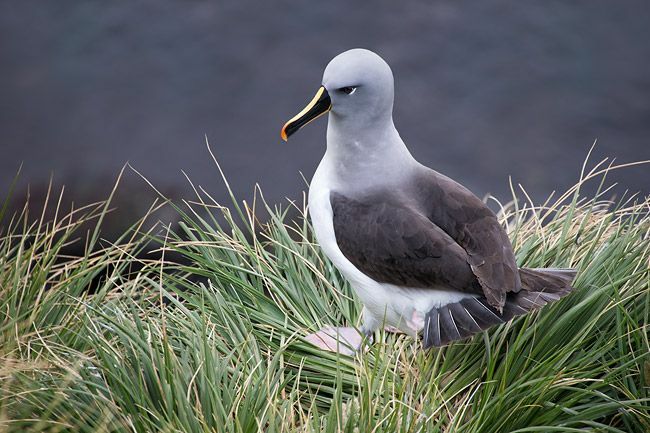 We spent the morning at the north side of the island at a colony of Black-browed Albatrosses that was located on high cliffs overlooking the ocean. Getting a clear view of the birds with a pleasing background is always more easier said than done, but if you change position often enough you will always find what you are looking for. 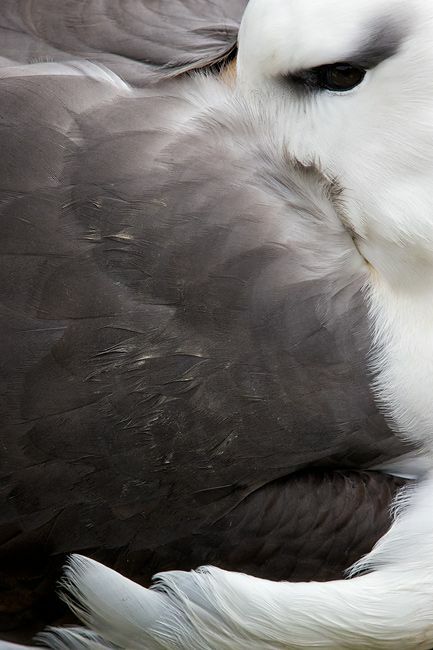 As most of the birds were on the cliffs below, I decide to get close with the long lens and create some intimate portraits of sleeping albatrosses. After the hike back to the beach we crossed the bay to the south side of the island in the zodiacs. 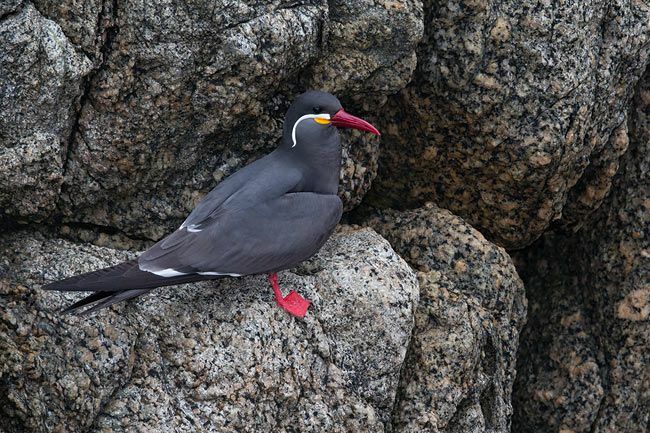 Here we took a walk through the fields to the exposed north side of the island were a large rookery of Black-browed Albatrosses, Southern Rockhopper Penguins and Imperial Shags was located again on high cliffs with large breaking waves down below. Forty mile per hour wind from the north made photography a challenge, as did the sun, which was shining right above us and created harsh shadows on the birds. Laying on the ground behind a large rock with the sun and the wind in the back was the only way to create some decent flight images of incoming Imperial Shags with nesting materials. 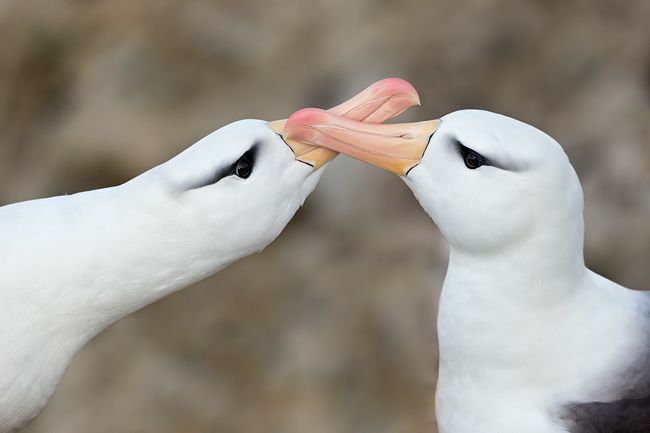 Only later in the afternoon the light became better, and the opportunities increased with Black-browed Albatrosses interacting with each other. Back on the ship the captain had decided to immediately leave for the town of Ushuaia, Argentina, in order to stay ahead of an approaching storm front that was on its way. The crossing to the entrance of the Beagle Channel was relatively smooth, although the wind had increased to gale force overnight. Once we reached the shelter of the Beagle Channel it was an easy ride back to the southern most town in South America. An amazing trip came to an end as we disembarked the “Ushuaia” the next morning for our flights back home. 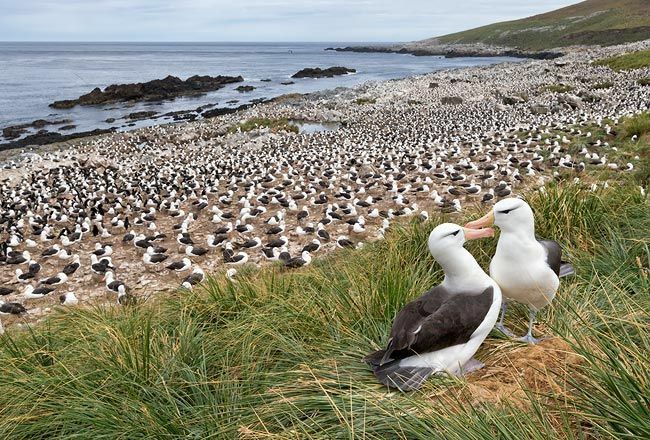 The scenery and wildlife in the Southern Ocean is impressive and will for sure pull me back in the near future, but it also created awareness that protection of the natural beauty and its inhabitants are of main importance for our future generations.